Welcome to our gallery of beautiful patio ideas. 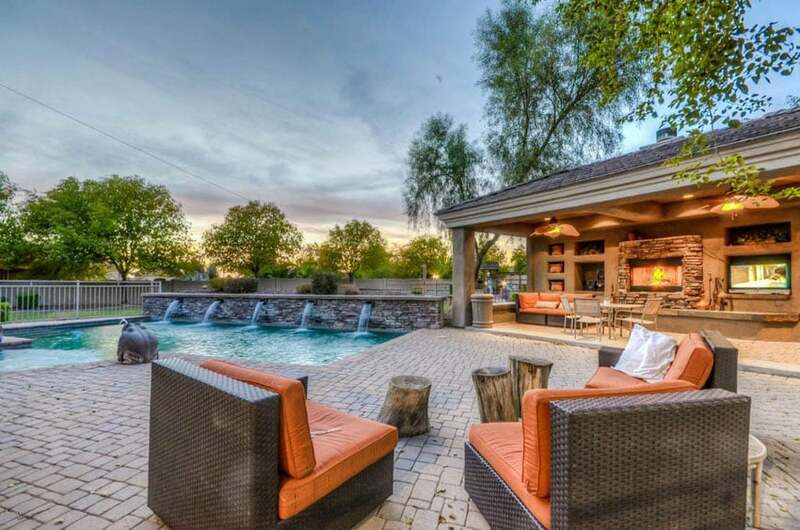 These patio areas feature homes with outdoor kitchens, fire pits, high-end outdoor furniture, hot tubs, swimming pools, gazebos, water features and amazing views. We hope these patio designs give you plenty of inspiration and ideas for creating your own perfect backyard oasis. 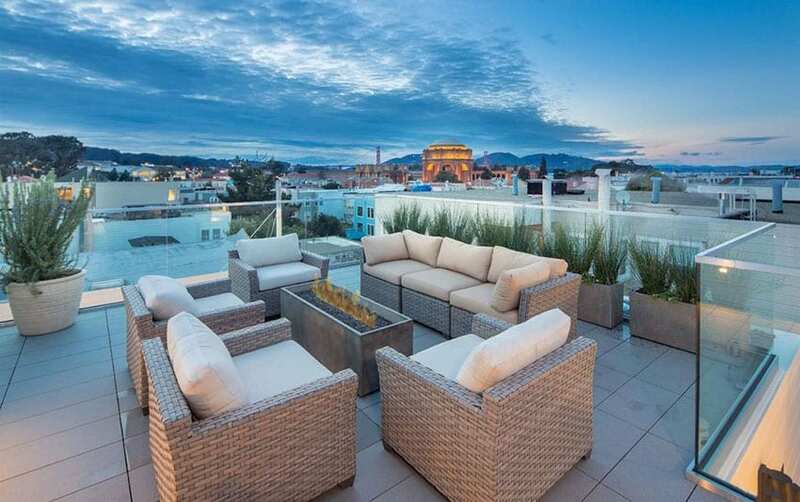 In the picture above, this spacious rooftop patio is the perfect chill spot to hang out because it offers plenty of seating areas in which you can move around as needed. It has no roof which makes it feel more open, but the trellis with creeping vines help provide shade during the daytime. There’s also a small fire pit at the center to provide warmth during cold nights and great spot to entertain with friends and family. What makes the perfect outdoor patio? For many its the views of the surrounding landscape, comfortable furniture, and well designed layouts. However, a beautiful patio must have functionality too. Elements such as an outdoor kitchen, bar, fire pit or covered porch, can add to the enjoyment and help create a space you will love. 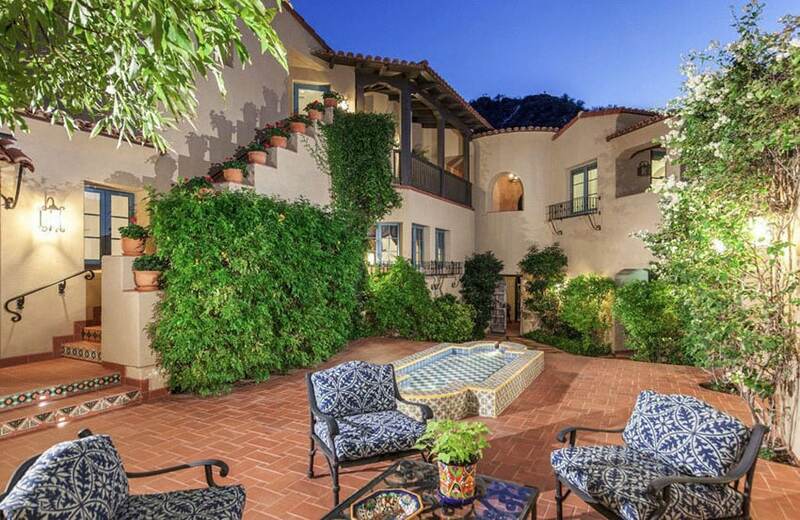 A massive Mediterranean home with a very spacious pool area with surrounding stone patio. 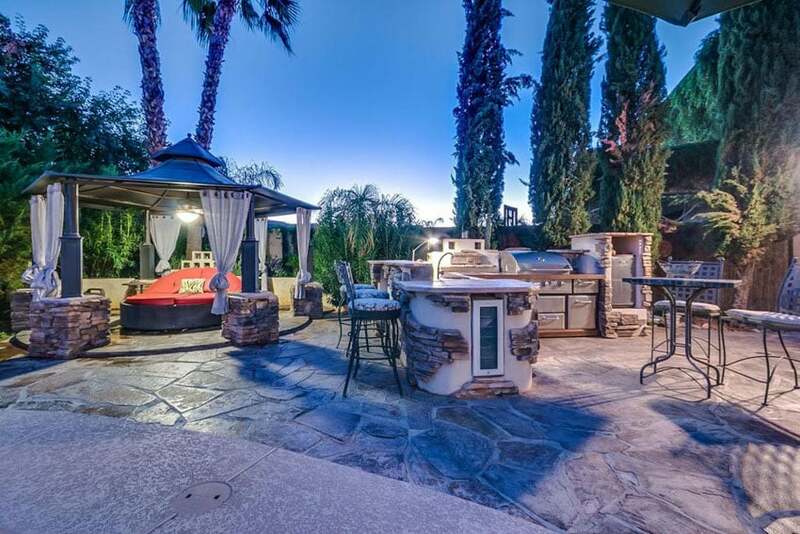 At the left side, you will see a covered patio area with a full furniture set-up, and outside, a rectangular seating area with a firepit in the middle which is made from the same materials as the stone tiles used around the pool for a more elegant look. Going for a more modern Mediterranean look, the exterior of the house is painted in brick orange, making look warmer and cozier. The pool area’s surrounding ground is covered with slate tiles to contrast with the warm colored walls and also has a small open patio area with wooden outdoor furniture to match the theme of the architecture. 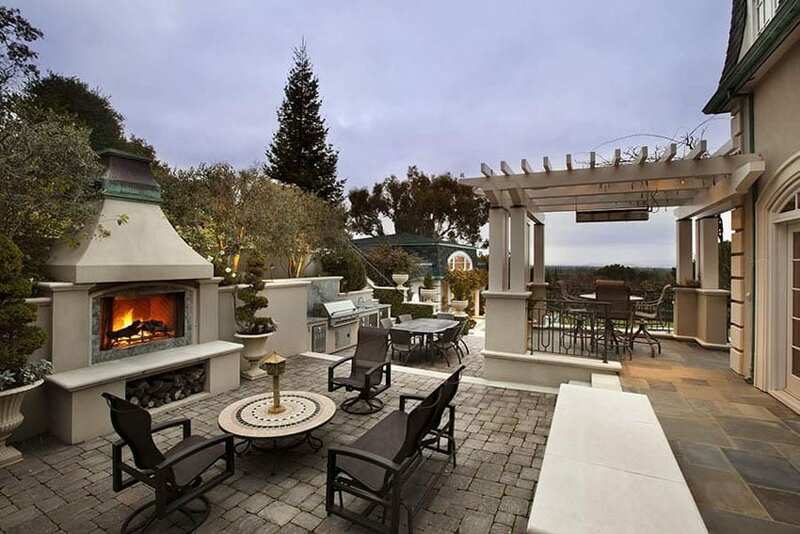 Open luxury patios often work best when portions of the space are devoted to separate areas. This poolside patio has no cover from the sides or the top, making it ideal for use at night or when the sun is not too hot. It has a more private feel to it as it is placed far from the main structure, yet it is still very accessible through the tiled pathways surrounding the pool area. Furniture pieces consists of matching loveseats and accent lounge made from pale ash woven synthetic rattan. 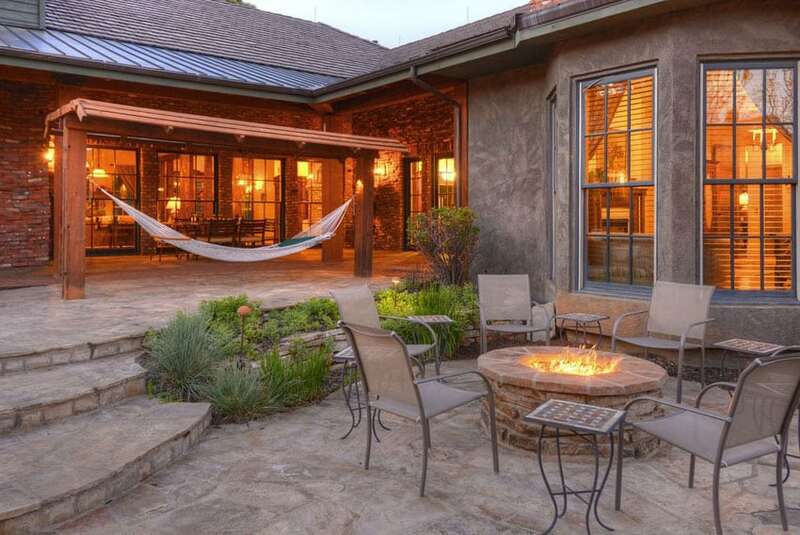 In the middle of the patio area is a long rectangular firepit to help keep you warm at night. The focal point of this area is definitely this massive sectional sofa with which directly views the infinity pool & the view of the sea. Made from resilient brown synthetic rattan with white cushions, the lounge area looks very minimalist, but by adding bright orange and blue pillows, it looks brighter and more lively. One of the most important part of setting up your patio space is selecting the right furniture. Outdoor furniture needs to be durable and weather resistant. Materials such as synthetic rattan, aluminum, plastic, polymer, wood, steel and wrought iron are all popular choices. The vast majority of outdoor furniture currently being sold is made from synthetic wicker also known as resin wicker. Constructed to resemble real wicker the material is better resistant to fading in sunlight, stain resistant, easy to clean and more durable that natural wicker products. Here are some patio furniture ideas to help you find a style that’s right for you. 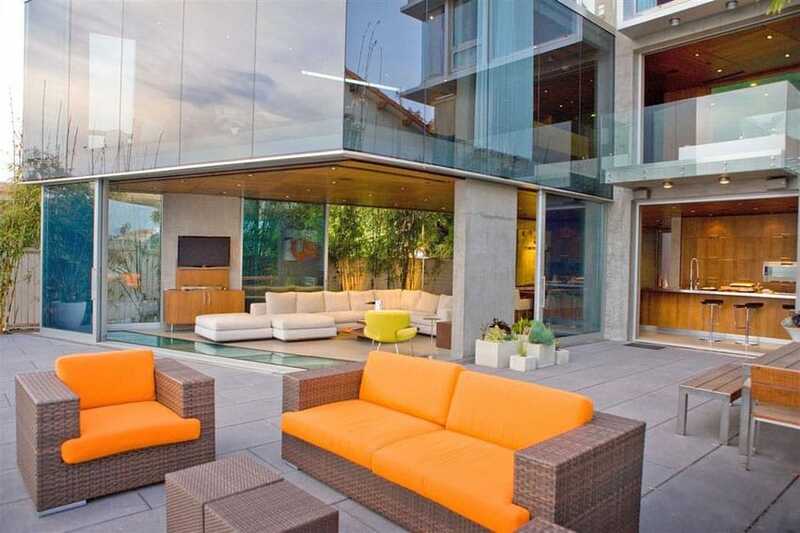 Modern contemporary homes look sleek & gorgeous, however, it could have a colder, less cozy feel. To help balance the cold feel given by the materials used on the house’s exterior, the patio furniture takes upon itself the task of adding a touch of warmth to the space. Patio furniture consists of a set of synthetic rattan sofa & accent chair with bright orange cushions and a dining area made from weather-treated teak wood. The different floor elevations of this patio area easily separates different areas of the patio and at the same time, make it look more dynamic. There are 3 areas. One is an open area with cement pavement, synthetic rattan furniture set & a stone outdoor fireplace, on the highest area of the patio are cafe chairs and a table and is partially covered with wooden trellis. At the lowest level is a large dining area with a grill / cooking area. This patio area has a very romantic and cozy feel to it. It has no roof or trellis for cover and is located in the atrium area of the house. All furniture pieces are made from bent rattan and has cream colored upholstery. You will also see lots of throw pillows scattered across the furniture pieces, making the seats look more comfortable and inviting. 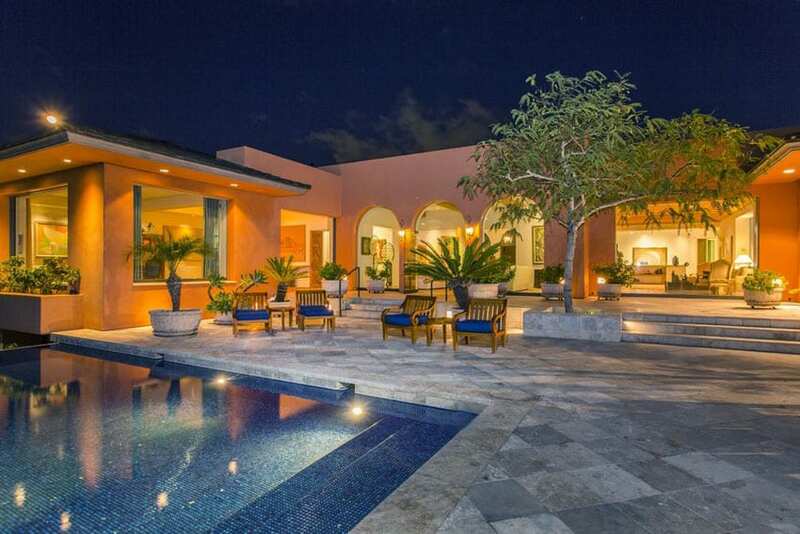 A semi-open patio area, which is placed under the roof of the main structure, but has open walls, giving it direct access to the pool and garden area. To give it a more outdoor feel, it used the same tiles as the tiles used to surround the pool area. The furniture used are all weather proof wood in pale oak for a more rustic feel. This patio area is perfect when you want to entertain your guests, or simply want to relax and enjoy the outside. 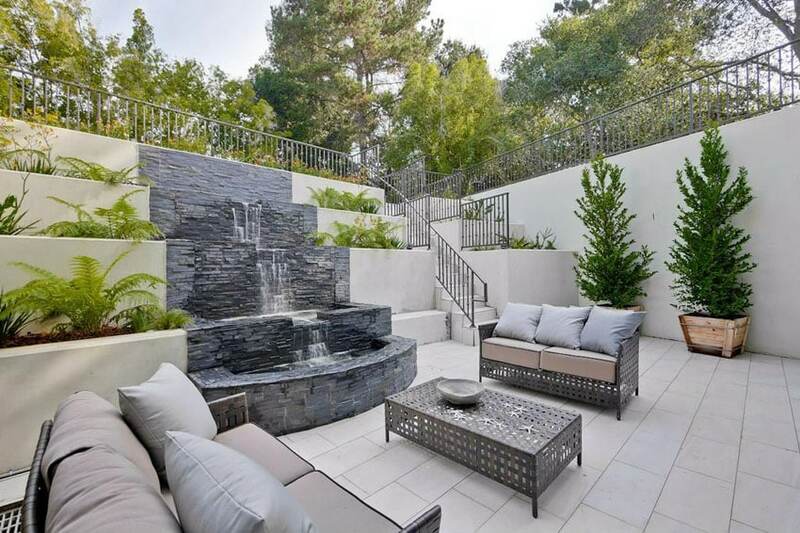 The concrete fencing gives it more privacy, and also allows the installation of a stepped accent patio water feature with incorporated plant boxes. 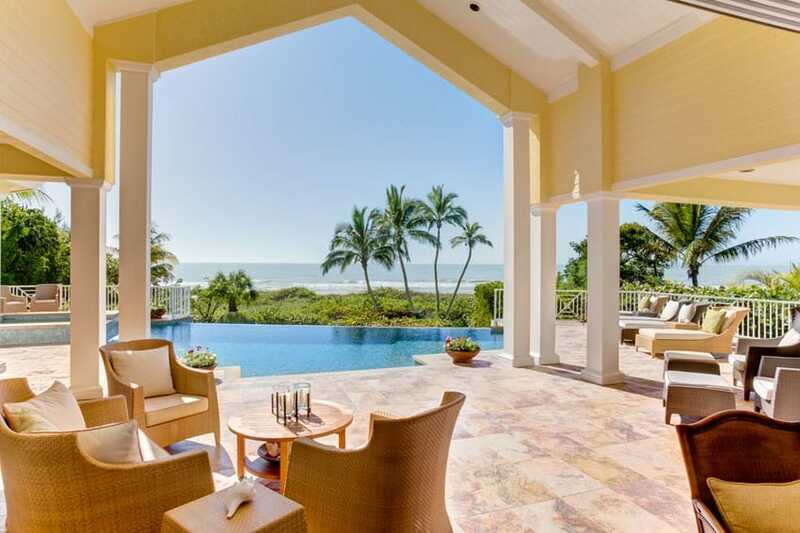 The house has a perfect clear view of the ocean, giving your a really perfect picturesque view. 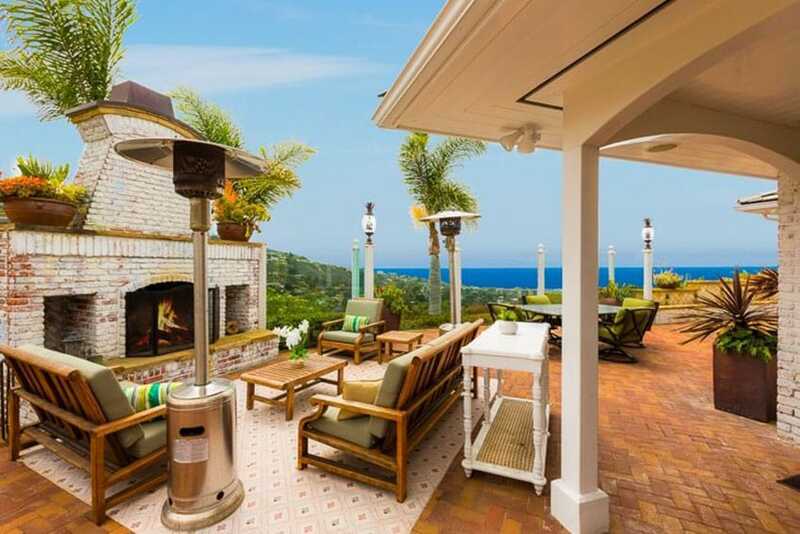 Because it’s in the coastal area and the sun tend to be hotter in such areas, the patio was placed in a covered area. To match with its landscape and to resist deterioration, furniture pieces are all outdoor-grade and matches the color scheme of its background. The sofa set is made from gray synthetic rattan with sky blue cushions, while the dining area uses the same material for the furniture but uses a pale beige color instead to make the area look warmer. A large open patio area by the pool serves as this small resort’s busiest place at night with its very long bar area and cozy sitting areas. Furniture pieces are all made from wengue finish synthetic rattan with beige cushions and lime green & orange accent pillows to match the orange sun umbrellas. Despite the classic style of architecture, furniture pieces in this small patio area is a bit more fun and quirky, injecting bright colors such as sky blue and yellow to give it a fun, young vibe despite its classic silhouettes. General finishes is uniform with the rest of the home – cream walls and light beige stone floors. A simple outdoor patio which connects to different parts of the house, making it very accessible. Furniture pieces is composed of a matching set of synthetic rattan with blue cushions and silver pillows, giving it a cool neutral tone which contrasts nicely with the warm-toned interiors. A covered patio is beneficial to protect you from sun, rain and keep debris from falling on your furniture. Many covered patios become a second dining area, and can enhance and expand your home’s living space and let you stay outdoor longer. This covered patio area is a bit more private / secluded as it is not part of the main structure, but instead has its own roofing and column supports. It is still easily accessible, however, because of the paved tiled pathways surrounded with plants. The patio area appears to be a nice area to relax and hang-out, with metal sofas with white cushions, a matching coffee table, a fireplace with TV above its mantle and even a ceiling fan to help with the ventilation during warmer months. See more walkway ideas here. 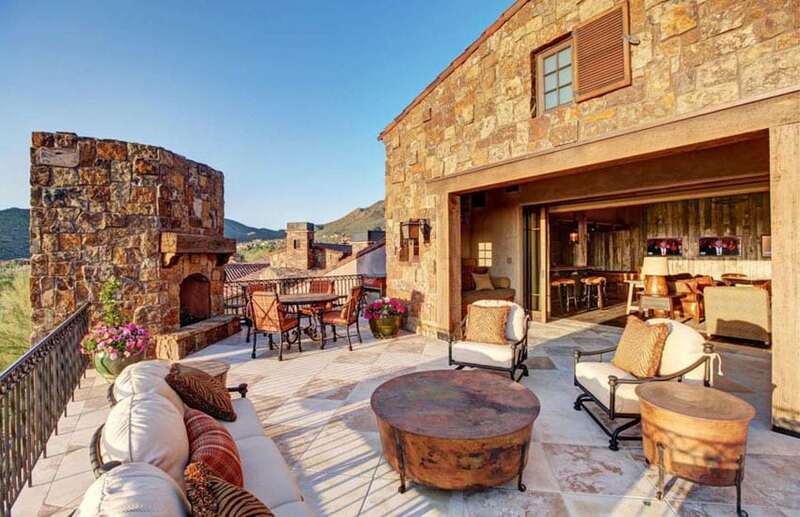 This mountain-side home definitely maximizes the gorgeous city view. 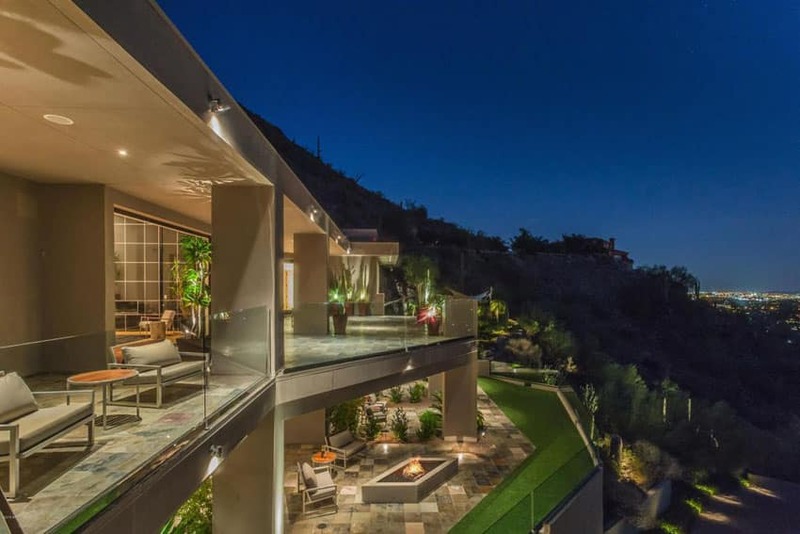 All areas of the home which face the slope area have large balcony areas with clear glass railings to provide unobstructed patio views of the landscape and city lights. It has a very simple neutral color scheme which definitely looks versatile & timeless, like cream metal framing and taupe upholstery for its furniture pieces. 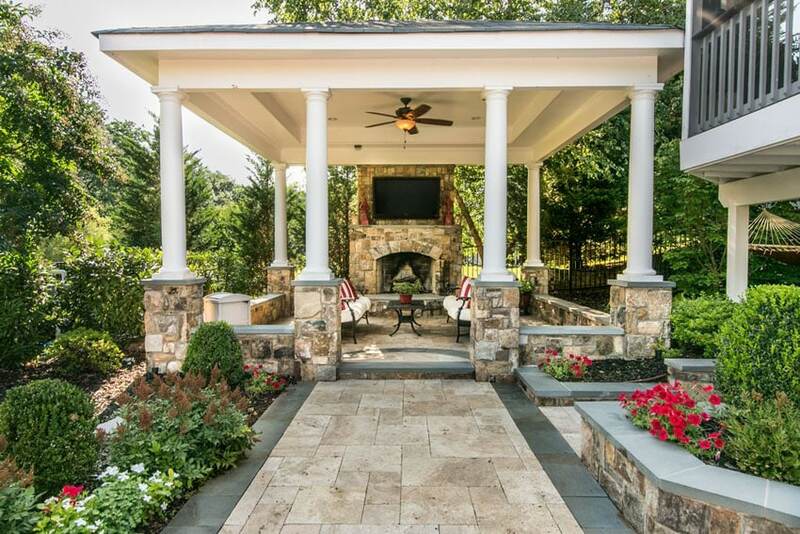 The covered patio design makes this an enjoyable spot any time of year. For a more elegant and classy feel, this large patio used a light cream and white color scheme for a more soft and feminine look. The sitting area on the left side uses furniture pieces with elegant curves, but is made of natural woven rattan with white cushions for a lighter look. 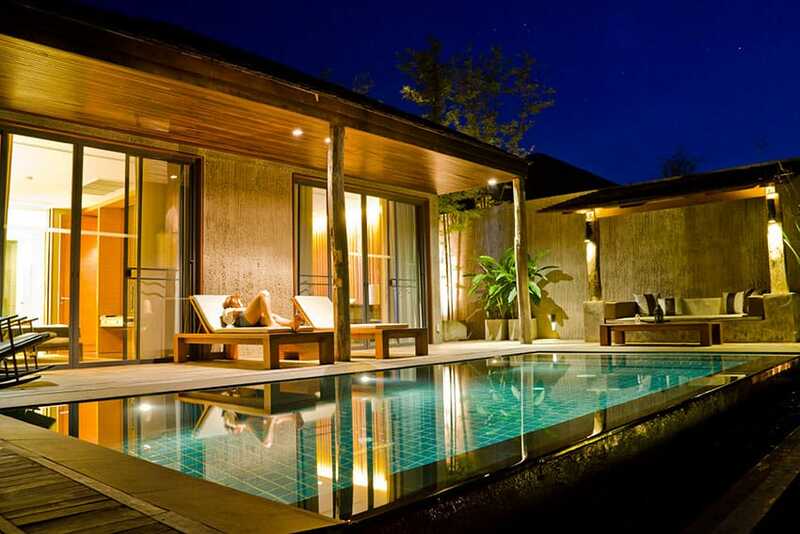 On the pool side you will also notice rattan lounging seats/bed made from various light colors/finishes of natural rattan, making the area look more interesting as well. Clean straight lines and light colors give this covered patio a minimalist look perfect for its architectural setting. It is simply furnished with a white upholstered lounge chair and an oversized coffee table with a built in electric heater. Lime green pillows adds a refreshing and subtle pop of color to the space. A pool-side patio with a very modern tropical feel as it uses dark wood decking and other wood elements in the design. For the furniture, it has 2 chaise lounges and a unique gray bench made from poured concrete with a thin upholstered cushion and steel blue accent pillows, to match the cool & tranquil atmosphere of the pool area. Paver patios are usually made from brick like pieces of concrete that are both inexpensive and easy to install. A paver patio can allow you to customize your design around your landscaping to create a space for sitting. Paver design styles such as jack on jack, running bond, herringbone and pinwheel are common and can be created without any previous experience. This video shows you how to create a paver patio with step-by-step instructions. 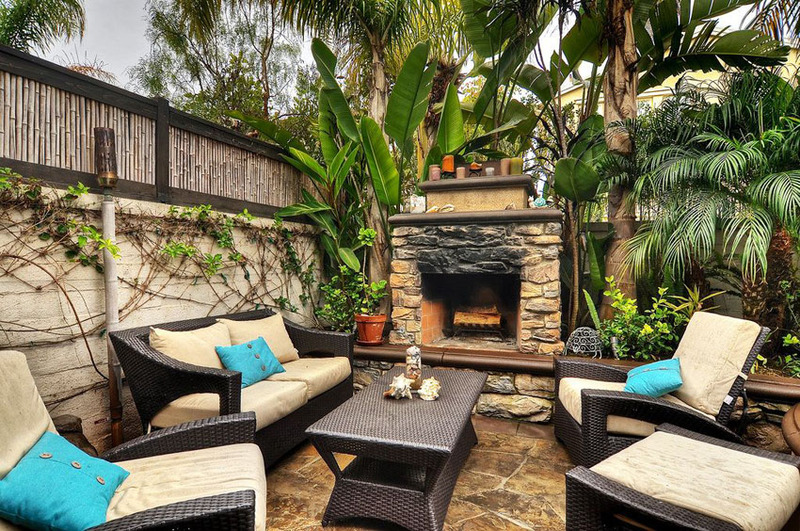 This open brick patio area has a more laid-back tropical feel to it. You will see that they have planted pine trees around the area, as well as other tropical shrubs. 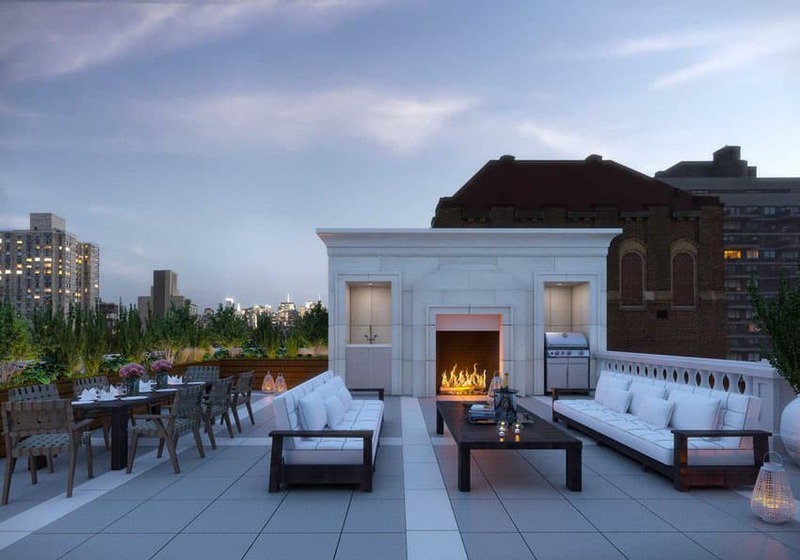 The furniture also adapts a fresh colors scheme of sage green cushions combined with solid teak wood furniture and an outdoor fireplace clad in aged white bricks, consistent with the look of the architecture. Also, to help make the patio area the focal point of the outdoor area, it uses Moroccan tiles in white with simple light orange diamond patterns, making it look like a large area rug in the sea of terracotta pavers. This is a very inviting patio area composed of an open patio and a covered patio area. The lounging furniture pieces are all matching – brown synthetic rattan with orange cushions. 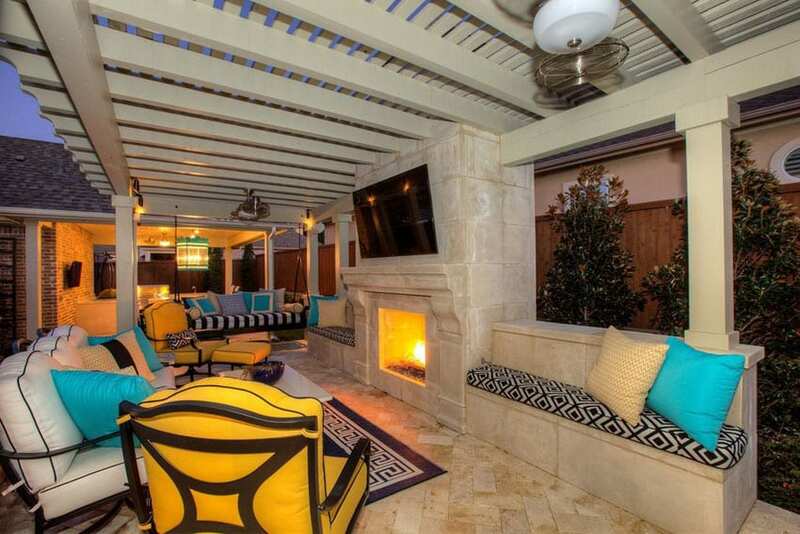 Aside from these, you will also notice niches on the walls of the covered patio area which was used as an outdoor kitchen and entertainment center. Niches were also used for the electric fireplace, additional storage and the large TV screen. 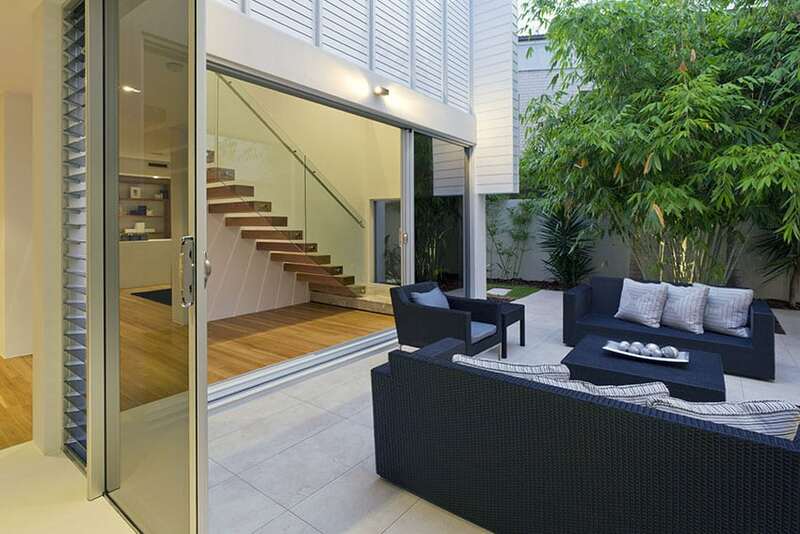 A simple open patio design which connects directly to the house’s back door. It is furnished with a matching set of bent iron loveseat, accent chair, side table & coffee table. You will also see a fireplace at the corner and a sun umbrella to shield you from the sun. When thinking of patio ideas its important to thing about your focal point and built out around it with furniture and decor that will get the look you want. 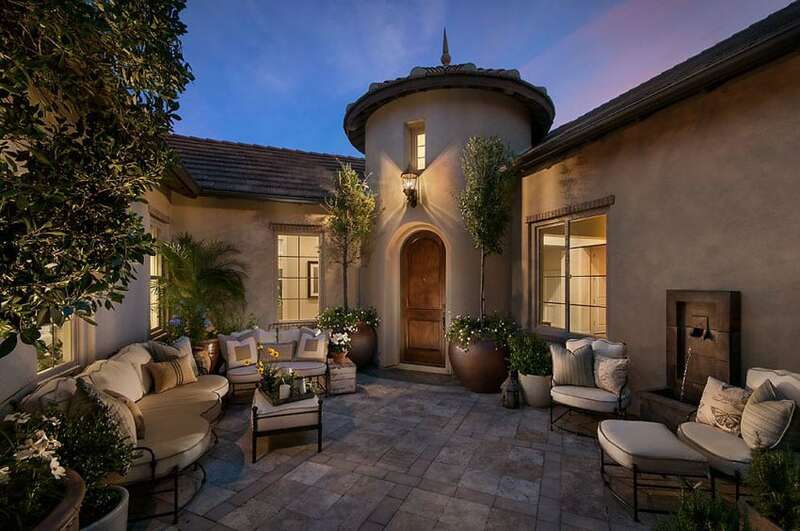 This private Spanish style patio area enjoys a great view of the garden as well as the back side of the house. It has a small tiled fountain in the middle of its paved floors, and is furnished beautifully with wrought iron furniture with printed cushions. A row of potted plants staggered up the staircase to the upstairs balcony bring some attractive red accent colors to the space. This flagstone patio feels a bit more indoor than the other examples as it has a low wall surrounding the area, giving it more privacy and protection from the elements. It has a high sloped ceiling with exposed maple wood trusses, stained in a darker color. Inside, you will see large quarry flagstone flooring, and synthetic rattan furniture pieces in fun colors like dark orange and slate gray. 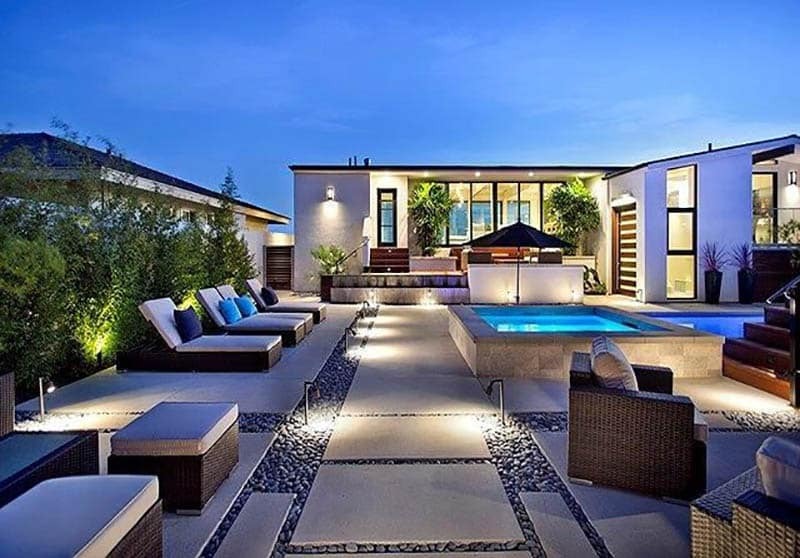 Luxury patios with outdoor lounging areas are inviting and can provide the feeling of being at a 5 star resort. Not only is there a gazebo with stacked stone, privacy curtains and day bed, the area is surrounded by tropical trees and landscaping. 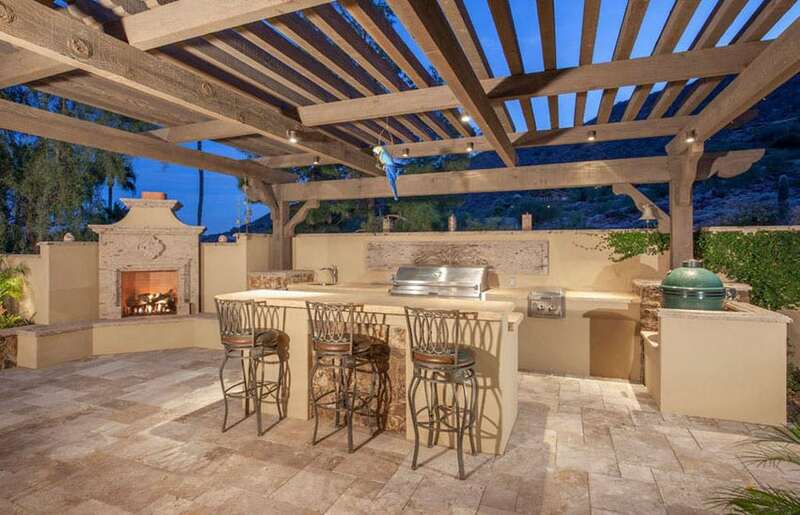 An outdoor kitchen shares the space and provides bar style seating for friends and family. By segregating different area/sections, this patio was able to maximize the space for different functions, and at the same time, keep an open layout. From thus view, you will see that there’s a grill area, a bar area, small dining area and a covered sitting area. The overall feel is on the cool side as it uses flagstone for the floors. 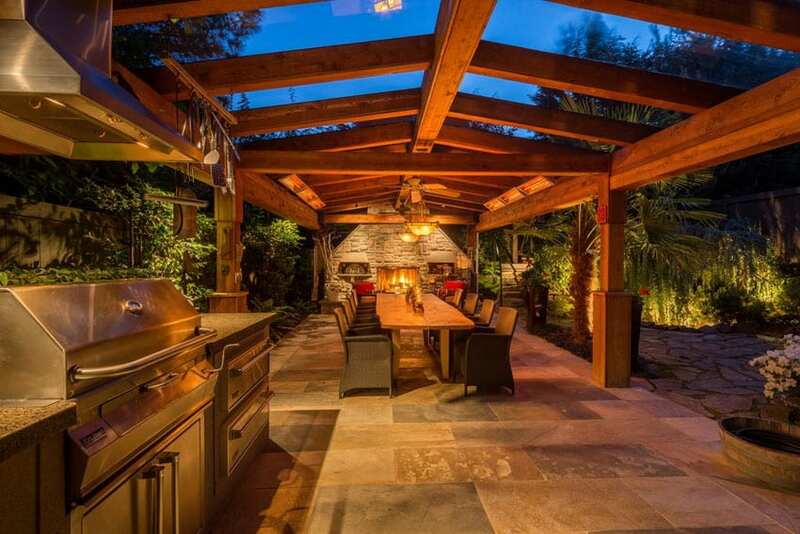 Tropical plants give this patio a relaxing yet mysterious feel to it. Because of the small space, it feels a little more intimate. Outdoor synthetic chairs and table are great for use outdoors and can be adorned with different cushions depending on the style you want for your design. What stands out the most in this patio design is the hammock placed on teak wood columns and trellis overhead cover which allows you to nap and relax outside. On the lower area, metal cafe chairs surround a round stone outdoor fire pit – a perfect setting for night time snacks and relaxing. 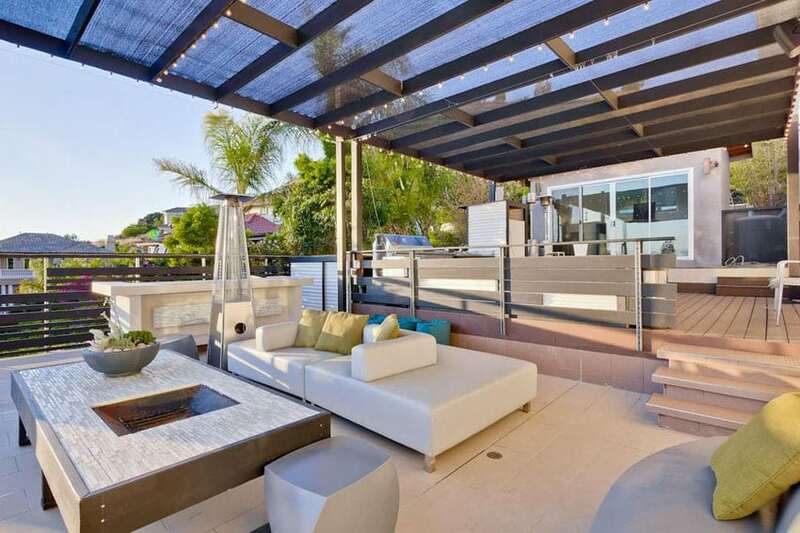 A contemporary open patio at the balcony area which has a gorgeous view of the outdoors. Floors are made of cream colored granite stone and furniture pieces consists of 2 lounge sofas with white-painted metal framing and matching white cushions, and a white square coffee table. Stamped concrete patios are a great way to modernize your backyard design and has several benefits that homeowners love. First of all stamped concrete is poured on site allowing you to get the custom look you want for your space. Secondly it is easy to clean by sweeping away debris and using detergent and water to remove anything that’s left over. Third, stamped concrete is durable and low maintenance. Going for a more outback feel, this gorgeous patio is surrounded by trees and plants, giving an illusion that it’s set in a forest area. To enhance the experience further, there instead of placing roofing on the solid teak wood beams and columns, it uses clear fiberglass materials to enable you see the surroundings. Because the area is exposed to the elements, materials used for finishes and furniture are also appropriate for outdoors. Natural stone flooring, weather-treated wood and synthetic rattan furniture were used, and all keeps a warm-toned finish for a more cozy feel. Matching the elegance of the house, furniture pieces in this patio area also uses curvy, classic silhouettes. The outdoor cafe area uses black painted iron furniture and a marble topped table, while the furniture in the covered patio area uses woven synthetic rattan. 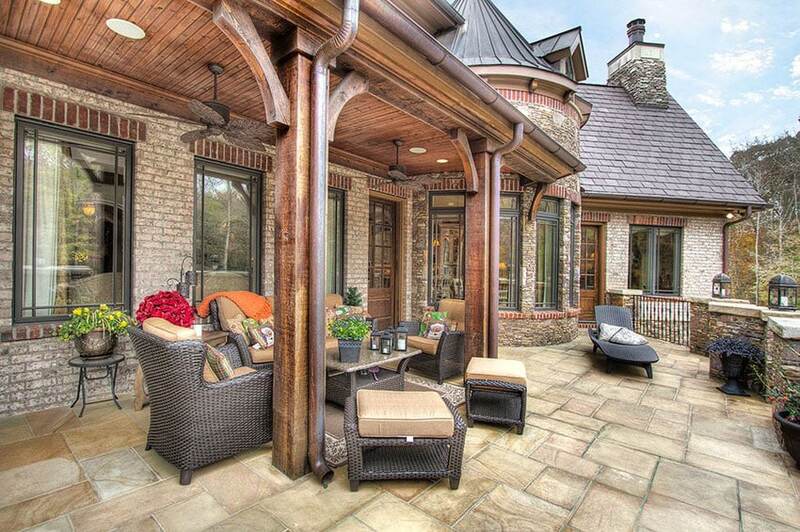 Classic English architecture already sets a classic and rustic feel to this patio area. The aged stone floors, wood columns, ceiling and bricks walls already give so much personality to the space, making it easy to furnish the patio more simply. This example uses a matching set of dark ash finish synthetic rattan furniture with beige leather cushions, which also matches the overall color scheme and feel of the space. 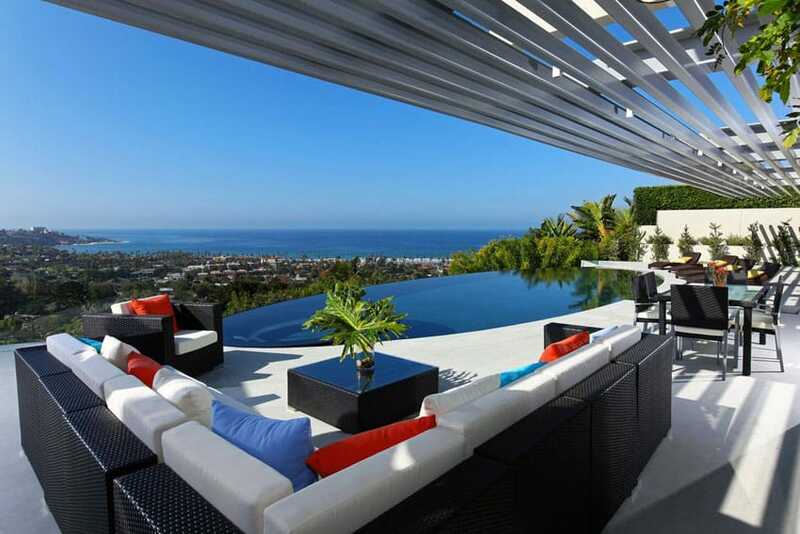 Gorgeous modern architecture combined with the natural background provide an excellent backdrop for this patio area. The flooring is poured cement with gaps in between, allowing grass to grow in them. Furniture pieces are solid weather-proof wood with beige seat cushions and a wooden firepit, making it look coordinated with the wooden architectural finishes. Going for a more classic look, this large patio area opted to use bent iron furniture with white cushions to make them more comfortable. At the corner of the patio is a fireplace made from stone masonry and a set of dining table made from bent iron and has orange cushions making the area look vibrant & fun. 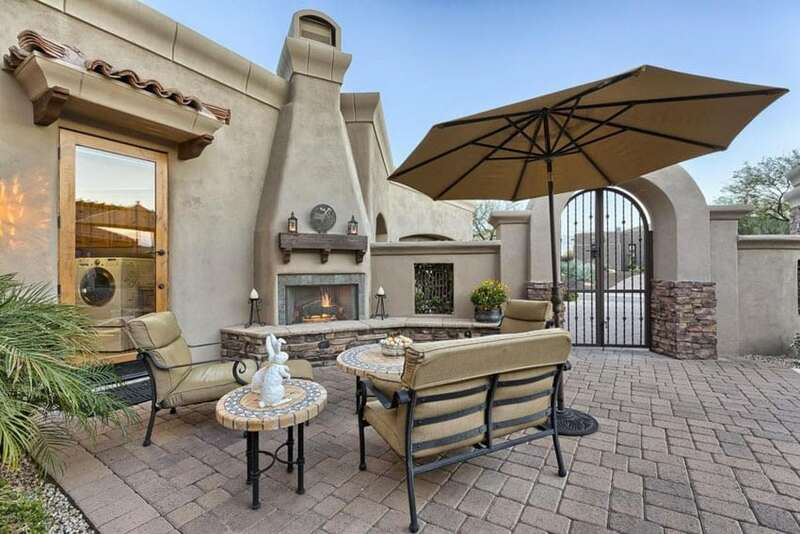 This lovely backyard concrete patio is well furnished with outdoor seating with comfortable cushions surrounding the metal bowl shaped fire pit. A great place to socialize and relax, this backyard patio layout is setup to create a great spot for entertaining guests. 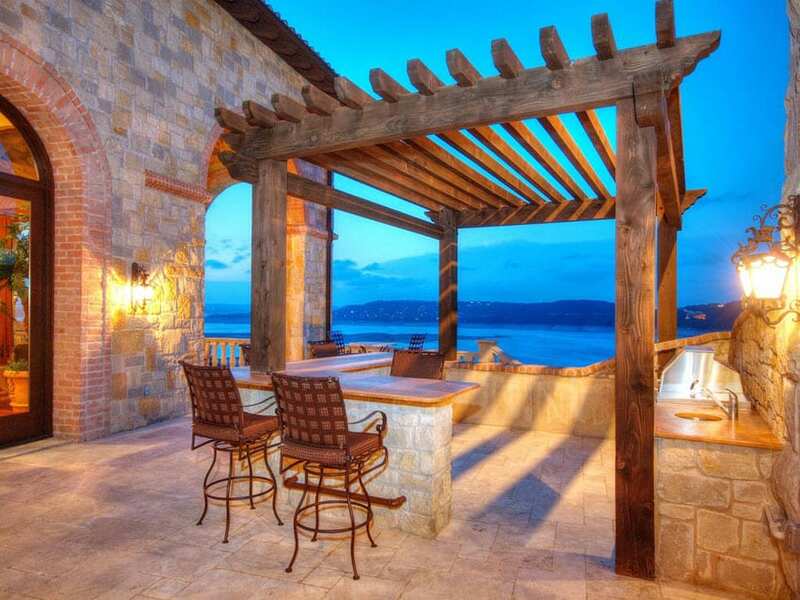 A patio bar is a great place for entertaining friends and family. 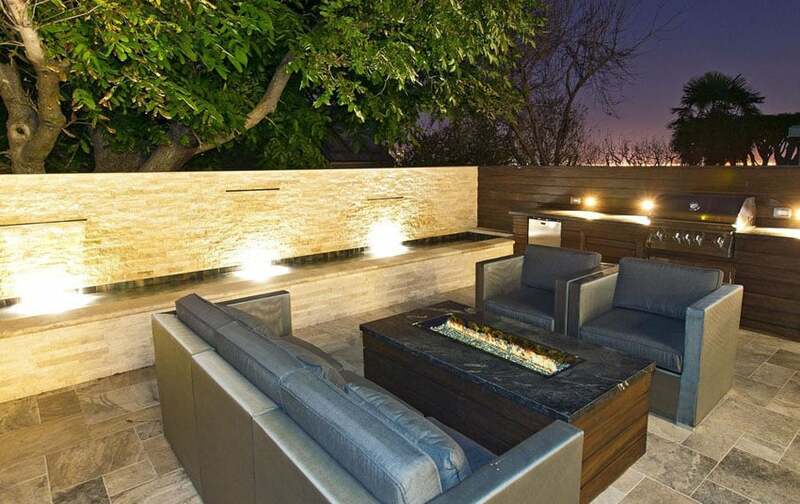 Since most patio bars are used at night it’s important to have plenty of lighting and some aesthetics such as a fire pit or outdoor fireplace to gather around. A perfect outdoor living area just placed right by the exit doors and large picture windows makes it feel like all areas are open and are connected. The flooring material are red bricks, making it slightly more vibrant the dark brown finish of the synthetic rattan furniture. Plan white seat & back cushions gives the place a lighter & brighter feel. This patio is even more sparsely furnished than the other simple patio examples. The main function of this example is as a bar and grill area, which explains its long counters for food preparation and a bar counter area. A trellis serves as the cover for the area, and uses an aged walnut for a more rustic feel to match the antique iron bar stools. This is another semi enclosed patio area, with pale maple wood trellis, beige granite tiles and a full kitchen counter for the grilling area. It also has a bar counter with 3 metal bar stools to complete the bar area. At the far left corner you will see the fireplace in which you can bring chairs and other seats to relax by the fire. An open layout is a great canvas for coming up with beautiful patio ideas. 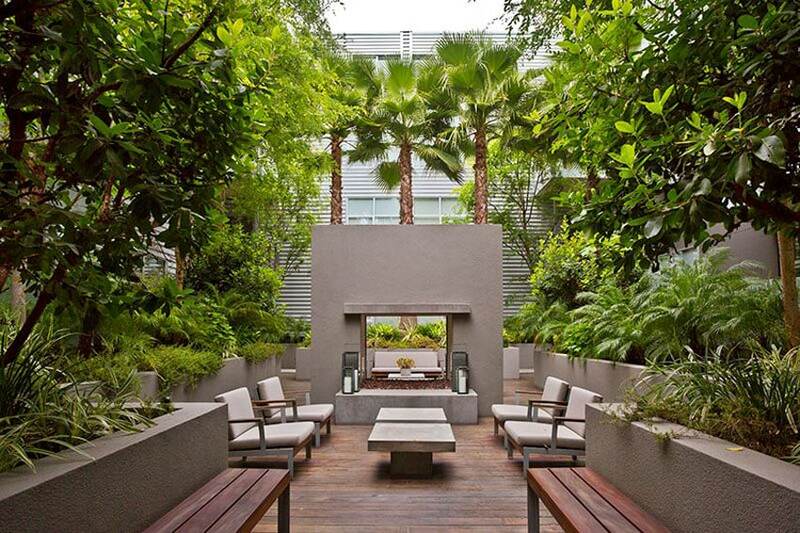 This open patio looks so elegant that you would think it’s an indoor living room. It has a classic-inspired fireplace with display niches on both sides, and an elegant living room set made from weather-treated wood in Mahogany finish with white cushions and pillows. On the side, there’s also a dining area which uses outdoor-grade furniture as well. Patio fire pits can be an excellent addition to the home because they are easy to put in and can become a great gathering place for enjoying your patio. When selecting your fire pit you’ll have to decide between a gas or wood burning style. It’s also helpful to choose a type that is rust resistant or portable if you wish to move it around. This example has both a covered patio area and an open patio area, allowing you to choose which area you prefer to use. The covered patio area uses wengue finished wooden furniture with light cream cushions, while the open area uses wengue finish synthetic rattan. So even if the two areas uses different materials, it still looks uniform as it uses the same color for its finish. 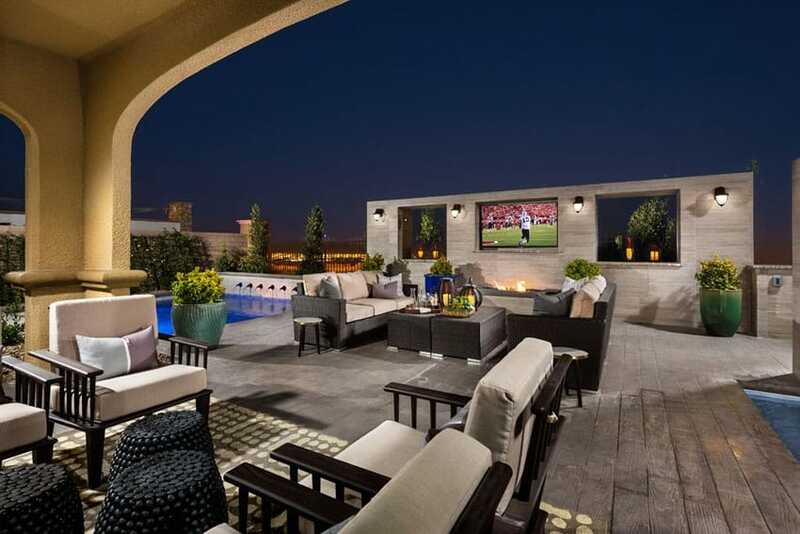 Another interesting feature is the large TV screen which was incorporated into the accent wall of the open patio positioned above a contemporary fire pit. 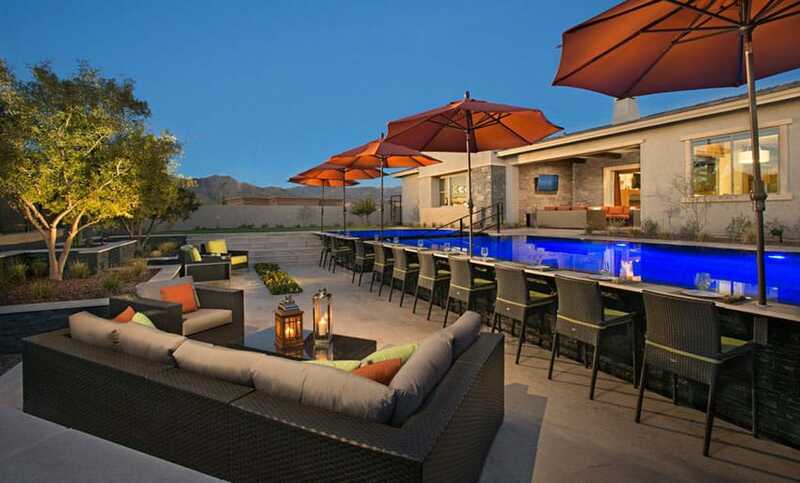 The patio fire pit near the pool provides the perfect backdrop for entertaining at night. 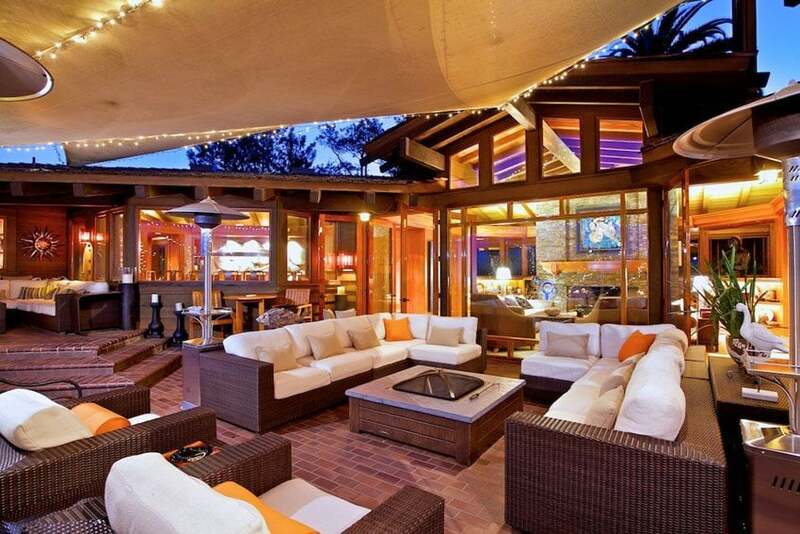 The well-matched colors in this semi-open patio area makes it look warm and elegant. 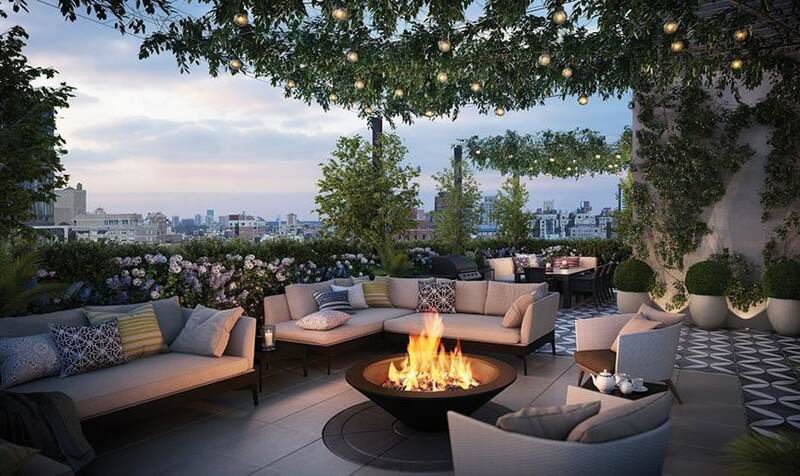 You will see the use of cream colored sandstone tiles all-over, the use of classical ionic columns to support the Teak wood trellis and the matching black-painted iron furniture with beige cushions. Smaller spaces should not deter you from coming up with beautiful patio ideas. You just need to list essential items and use furniture sizes in proportion to the size of the area to be able to maximize the space, just like this in example. A slate blue upholstered sofa set was used, and a rectangular firepit is built into the coffee table. On the side you will see a small grilling area with enough space for food preparation. This open patio is integrated into the structure / landscape design. Instead of using movable furniture pieces, it creates benches with poured concrete and attaches it to the taller planter boxes which serves as the backrest of the sofas. To make it more comfortable, removable cushions with beige fabric were used. 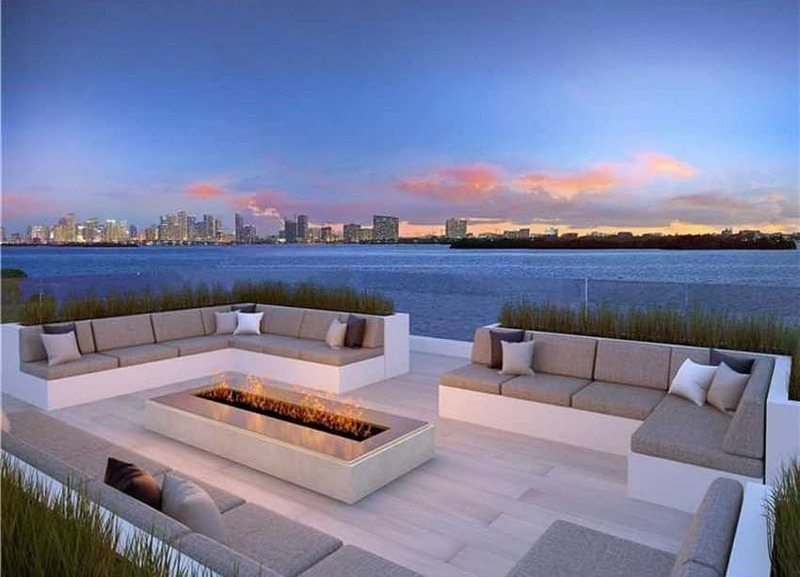 In the middle of the spacious sitting area is a firepit integrated into the long coffee table. A pool-side covered patio area which is perfect for when you want to take a break from the sun or the pool. It has fully upholstered seats which uses water-resistant fabrics, for a more cozy seating area. There’s also a bar counter in the area and a low dining table for a casual Asian-style dining feel. Because the back porch area is very big and spacious, various layout set-ups were produced. Starting from the far back area is the dining set made from bent synthetic rattan in white finish. 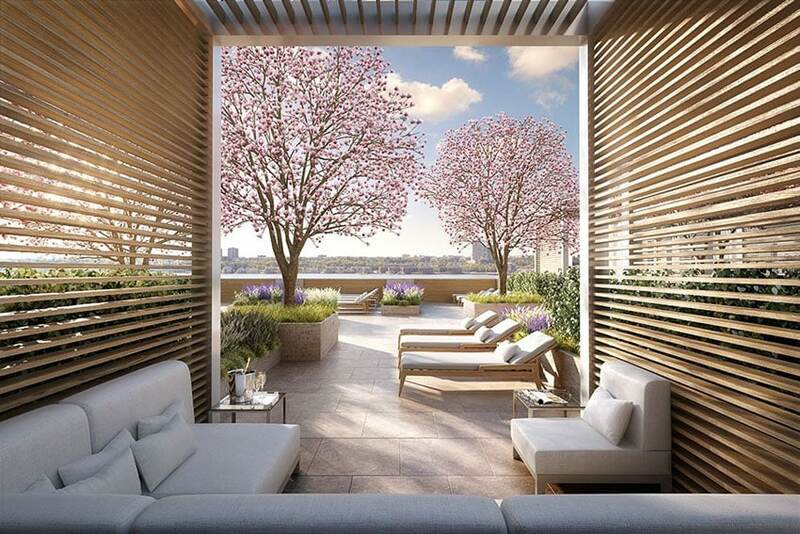 At the middle area you will see a roofed porch area, where you will see 2 sofas and 4 armchairs made from stainless steel framing and painted in white. The armchair uses light blue for the cushions, giving a nice & soft pop of color. 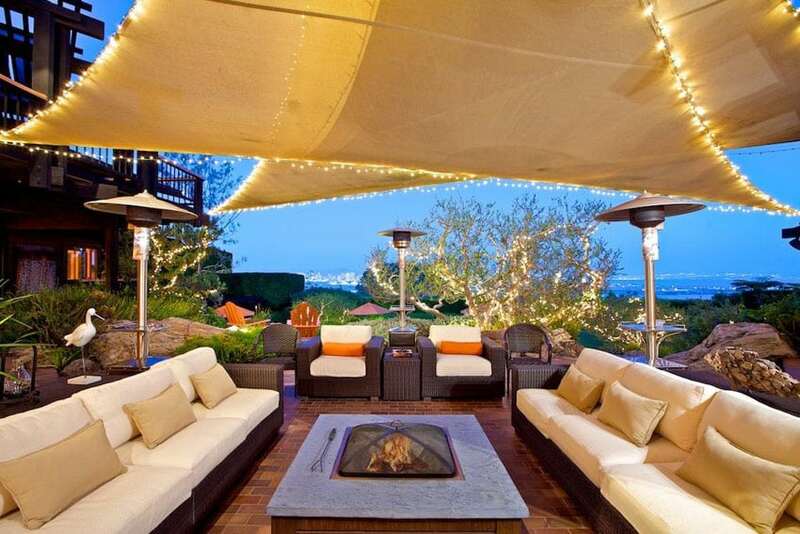 For the open patio area, there are 2 chairs which have the same style, 2 rectangular ottomans and an electric firepit. 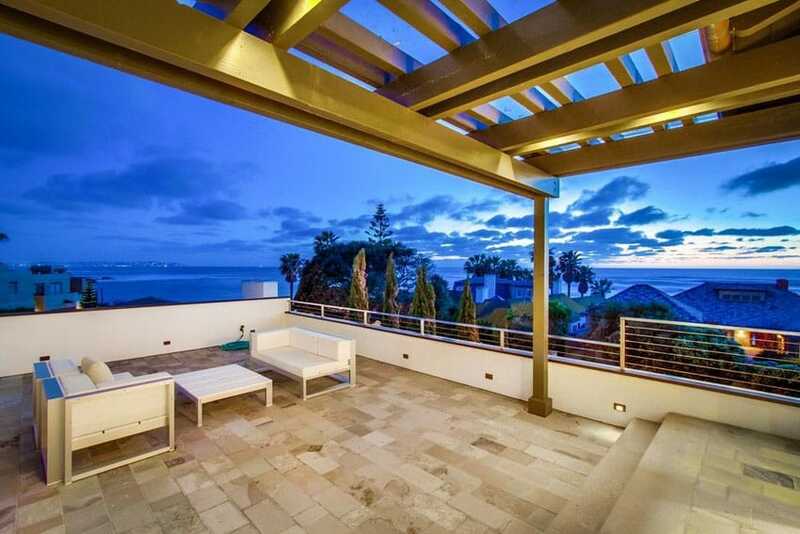 Clear glass railings allows this balcony patio area enjoy a clear & unobstructed view of the city. Privacy is also not an issue as it uses pots of plants on some sides of the railings to function as not only an ornament, but also a privacy barrier. Furniture pieces used is a matching set made of synthetic rattan in a pale beige color with light cream cushions for a simple yet relaxing color scheme. The slope of the land which the main structure is constructed allows for the creative use of the change in elevations and an open canvas for patio ideas. 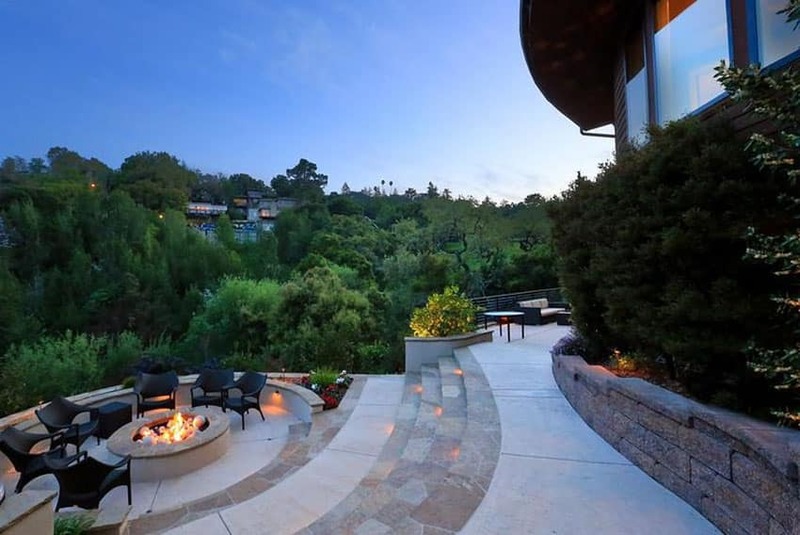 For this patio, it is placed on a round area after a few steps down the slope. Furniture pieces are simply composed of 6 pieces of wengue finish synthetic rattan side chairs places around a built-in firepit. Canopies are great for enjoying your outdoor living areas day or night. Fabric hanging shade with accent fairy lights adds a more romantic ambiance to this patio area especially since it matches the accent lights on the surrounding trees/plants. It has lots of sitting space, with sofas, accent chairs able to accommodate 10 to 12 people comfortably at once. In the middle is a fire pit to provide warmth during colder nights, while corner lamp posts keeps the area bright when you don’t need the heat. This modern backyard features a gravel patio with concrete slabs and swimming pool with elevated spa. 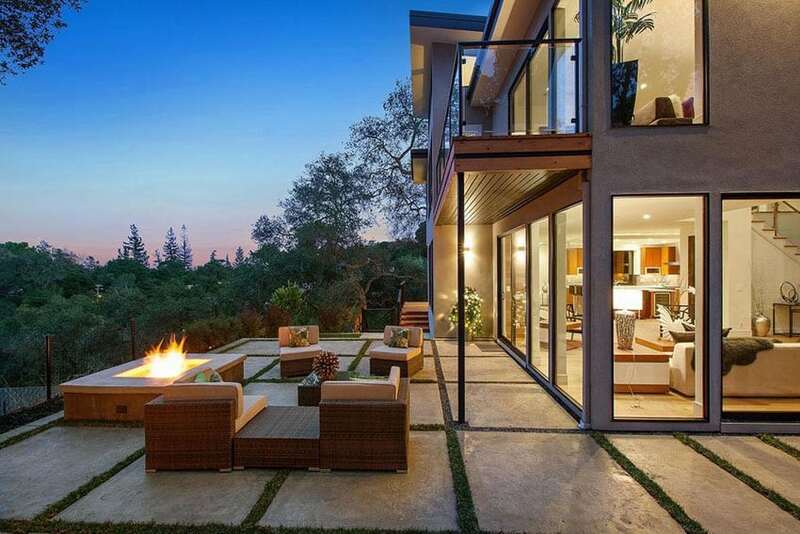 The poured concrete provides plenty of space for outdoor entertaining from an abundance of wicker lounge chairs.